Grand Bahama Island is the fourth largest island and second most popular tourist destination in the Bahamas. Located less than 70 miles from the coast of Florida, the island is 539 square miles in size and features long stretches of secluded beachfront, wildlife habitats, tropical gardens, charming neighborhoods and plenty to see and do. Grand Bahama Island is 530 square miles, 96 miles long from east to west, and 17 miles across at its widest point. Grand Bahama Island is in the Eastern Standard Time zone (EST). Daylight Savings Time (DST) is observed in the summer months from March to November, when the time is shifted forward by 1 hour to Eastern Daylight-savings Time (EDT). It shifts back by 1 hour after the summer months, and returns to EST. Automobiles drive on the LEFT side of the road. The crystalline ocean encircling Grand Bahama Island is a playground for water sports of all kinds, from boating or jet-skiing to kite-boarding and para-sailing. Close-in shallow areas are filled with coral reefs and submerged rocks, creating an abundant underwater world for fishing, snorkeling and diving. Shark-feeding dives, dolphin encounters and other adventurous dives can be arranged through UNEXSO. Grand Bahama Island is a nature lover's paradise with myriad places for hiking, biking, bird watching, horseback riding and paddling. Many excursions can be arranged, including kayaking through a mangrove preserve, enjoying lunch on a secluded expanse of beach or exploring the island's unique underwater cave system. Excellent outdoor activities and some of the best sightseeing on the island, including stunning Gold Rock Beach and a glimpse into the island's earliest history, can be enjoyed at the island's three National Parks. The commercial and tourism hub of the island is Freeport/Lucaya, a modern planned city close to the international airport and seaport, and within an easy stroll of tranquil resort areas. Established as a tax-free city in the 1950s, Freeport offers excellent duty-free "bargains" in jewelry, china, crystal, linens, leather goods and designer apparel at colorful Port Lucaya Marketplace, an international-style marketplace, and the shops at the ultra-modern Port Lucaya Marina. Beautiful year round sub-tropical weather provides the perfect environment for magnificent championship golf courses. And the island's nightlife offers excellent choices for casual or elegant dining, lively bars and lounges, dancing, music and other entertainment. Shoreline is located just 5 miles from Lucaya in Freeport on Grand Bahama Island. It is located on the Fortune Beach, one of the most beautiful white sand beaches anywhere in the world. Shoreline is a place to reconnect with family and friends while marveling at the beauty of your surroundings. It’s a place to walk the undiscovered white sandy beaches and reflect against the shimmering turquoise waters. Shoreline celebrates the natural wonders and timelessness reminiscent of the old-Florida living that embraces the true values of a community. Thanks to the warm Gulf Stream currents and balmy trade winds, Grand Bahama Island has sub-tropical weather, which is generally pleasant all year long. Winter: October through April with temperatures averaging 70-75°F. The rainy season spans from May through October. 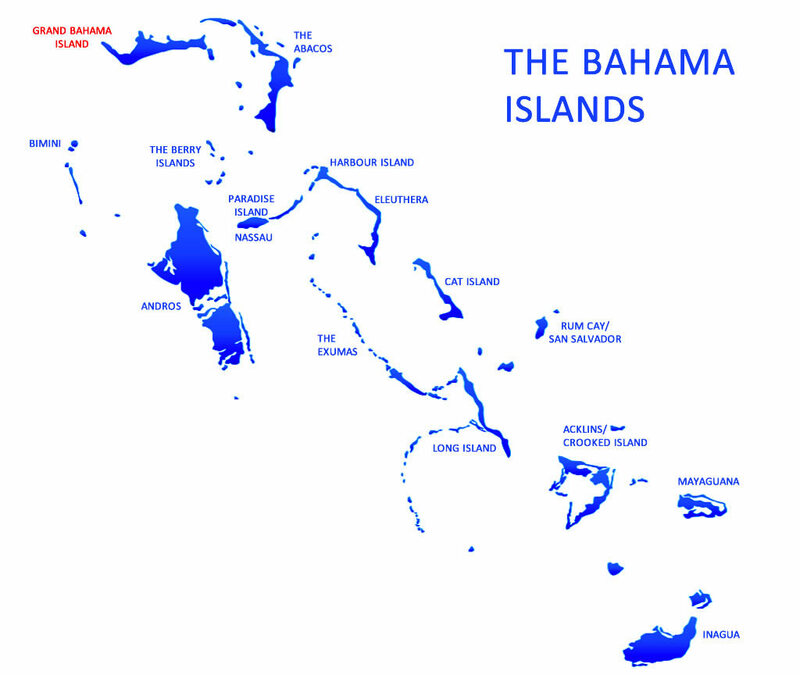 The Bahamas is a chain of 700 islands and about 2,000 cays (low islands or reefs of sand or coral). However, only 29 of the islands are inhabited. The Bahamas is in the North Atlantic Ocean on the eastern edge of the Caribbean, just 72 kilometers (45 miles) southeast of Florida. It has an area of 13,939 square kilometers (5,382 square miles) and is a bit smaller than Connecticut. The islands have a total coastline of 3,542 square kilometers (1,368 square miles). The largest city in the nation is Nassau, the capital, and the second largest is Freeport.